There’s so much that needs to be done right now to challenge the breast cancer industry. And we know that when people like you and me join together to demand a better world, we can and do win, against the odds. We can’t do this work without you. Help us raise $30,000 by the end of May to fund the #CancerResistance. Please make a donation of $25 or more right now. We’re facing an overwhelming number of threats to women’s lives and bodies from an administration that’s working hard to defund federal agencies and deregulate everything. And our independence from corporate influence has never been more important. Your investment in our independent, grassroots, patient-centered organization is an important form of activism. Donate now to join us in challenging the mainstream approach to breast cancer and changing the status quo. Breast Cancer Action has been challenging the cancer industry since 1990, and we’ve had some big wins. That’s because together we’re powerful. Together we can make a difference. 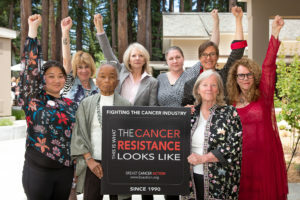 Together, we are the #CancerResistance. Please give as generously as you can today.